How to Get Good Result of Hair Transplant at a Young Age? How to Get Good Result of Hair Transplant in Young Age? Whenever a person goes for hair transplant he wants the good aesthetic result which improves his profile and makes him more confident. Hair loss at the young age is a very big mental trauma, It may be one of the important factors for anxiety and depression. At our clinic, we saw many young patients who don’t want to interact with people and avoid social gathering because of the male pattern alopecia. Here is a story of young patient 26-year-old with Norwood grade VI alopecia. He was on medical treatment for last one year but now he wants hair transplant in young age to improve his look. they may fall as age advances. So they may need more sittings of hair transplant in future. Safe donor area of the scalp is limited in every person but the demand of hair is unlimited. very important. Beard and chest are the preferred sites for donor’s hair. advantage. The volume of hair you get after transplanting beard hair is more. beard hair is different from scalp hair. more in length but their thickness is not affected. Chest hair is thin but gives good filling effect in between. A young man of 26 years otherwise healthy, no significant history of any disease, Drug allergy or smoking but has a strong genetic history of hair loss from the paternal side, Was on medical treatment since last one year and now he wants Hair transplant. 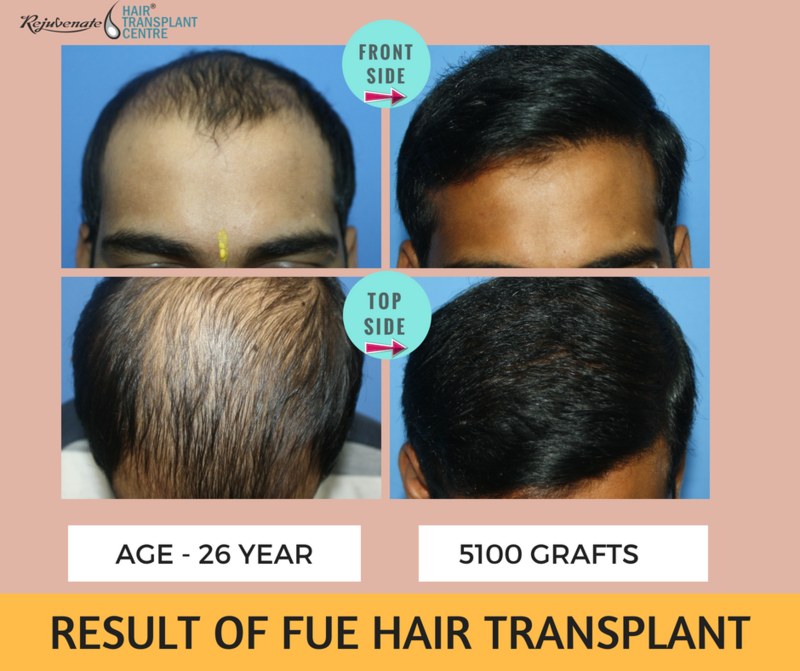 Hair transplant by FUE is the preferred method for most of the patients as they afraid of the linear cut on the back of the scalp. Similar is the case with this boy, He doesn’t want FUT at all. Looking on to the limited donor area we give him choice for taking hair roots from beard also, He agreed. We plan the case for 2 days. Day 1 for extraction from Scalp and day 2 for extraction from the beard. Routine Blood investigations like CBC, FBS, HIV, Australia Ag, SGOT and SGPT were done. He was instructed to shave his beard 3-4 days before surgery. We prefer to give oral antibiotic a day before surgery. On the day of operation trimming of donor area of the scalp is done and head wash is given. The hairline is planned and area to be transplanted is marked and discussed with the patient. After taking vitals and xylocaine sensitivity test local anaesthesia is given. 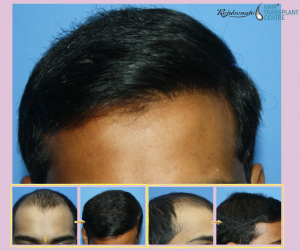 FUE hair transplant of 3100 grafts from scalp was done on the first day of the procedure. The dressing was done on the scalp donor area and the patient is sent home. Beard hair roots are extracted after anaesthetised the area. Beard is very sensitive so first topical anaesthesia is applied for 1 hour. After that Tumescent anaesthesia is given. For beard, it is more effective than routine anaesthesia. Punch quality and diameter is very important for the beard as we don’t want any visible scarring. Beard hair is more delicate than scalp hair. Out of body time should be minimum. We keep grafts in plasma to provide them biological atmosphere. Results are excellent, you can compare the hair transplant result before and after photographs of the patient. These are the result just after 8 months of hair transplant. The patient is very happy and he is now more energetic and enthusiastic about his work as the depression of not having hair is not there now. Also, his participation in social gathering is increased. He is also taking food supplements for his soon transplanted hair. Also, he is having sufficient donor area if he needs hair transplant in future to improve his density.